Saksham Koul 2 years, 6 months ago. 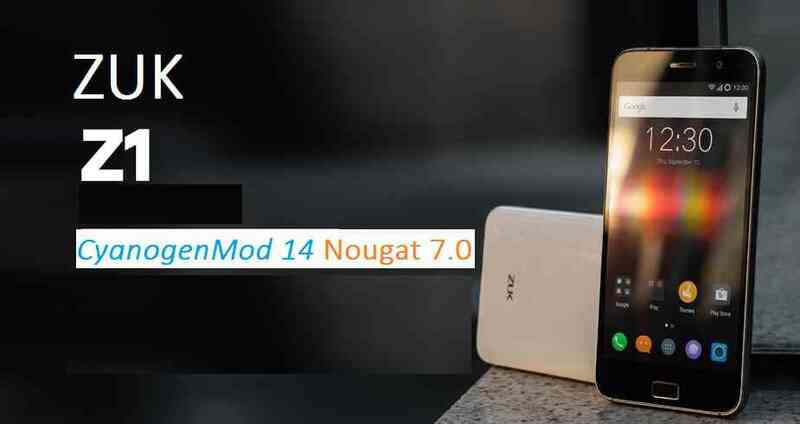 Android Nougat 7.0 ROM, CM14 for Zuk Z1 CyanogenMod 14 (CM14). We also have the Lineage 14.1 for Zuk Z1. For latest updates, stay tuned to the Lineage OS device list page. Since Google released Android Nougat Source code, we have update many Android NOUGAT AOSP ROMs and also many CM14/CyanogenMod 14 ROMs updated and many are yet to come. This CM14 for Zuk Z1 (ham) is brought to you by developer neohack. Another ROM is brought to you by developer OrdenKrieger. If you wanna help neohack for his good work, then you can donate him. Here is the link if you want to donate to OrdenKrieger. THIS IS AN INITIAL BUILD. THIS MAY NOT BOOT AT ALL OR IF IT BOOTS IT MAY HAVE MANY MORE BUGS THAN YOU CAN IMAGINE. TRY AT YOUR OWN RISK. Installing a custom ROM on a Zuk Z1 requires the bootloader to be unlocked on the Zuk Z1 phone, which may VOID your warranty and may delete all your data. Before proceeding further you may consider backup all data on the phone. You are the only person doing changes to your phone and I cannot be held responsible for the mistakes done by you. Download and Copy the GApps and Zuk Z1 CM14 ROM ZIP to your phone. First flash the Zuk Z1 CM14 ROM ZIP from device. Then flash the GApps zip from your device memory. Reboot and Enjoy the Nougat 7.0 ROM CyanogenMod 14 for Zuk Z1. Copy the latest Zuk Z1 CM14 ROM ZIP file to your phone. Stay tuned or Subscribe to the Zuk Z1 (ham) forum For other Android Nougat ROMs, CyanogenMod 14 ROMs, other ROMs and all other device specific topics. Cant pass CyanogenMod bootscreen. Bootloops. Please fix bootloops, thank you ! There is a new build of Zuk Z1 CM14/CyanogenMod 14 Nougat 7.0 ROM has been added from neohack. Try this one and let us know what is the status? is it possible to install a new version of cm14 without wiping the previous one? When you update a CM14 from a previous CM14 ROM then no need to wipe again. Fingerprint sensor setting vanished from settings. Else was working like charm! But please if you could help with these problems mentioned.